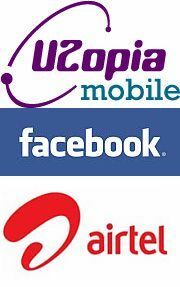 U2opia Mobile, a Singapore-based mobile solutions provider has launched Fonetwish, a platform for accessing Facebook via USSD (Unstructured Supplementary Service Data) in partnership with telecom provider Airtel. The service has been developed jointly with Facebook and it's the first of its kind. USSD (Unstructured Supplementary Service Data) is a menu-based system that allows interfacing with content based services. Unlike a normal browser, the USSD menu acts as browser to pull content to the phone, hence it does so without using the internet or activating GPRS capabilities. Shireesh Joshi, Director â€“ Marketing, Mobile Services, Bharti Airtel said, "In the Indian market scenario, where the penetration of smart phones is relatively low and use of internet on mobile is primarily limited to key cities, many users are excluded from accessing their Facebook accounts via mobile phones. The need for a ubiquitous access mechanism is a growing necessity â€“ and that's exactly what Airtel's USSD service for Facebook will help deliver." Airtel's 150 million Indian customers will be able to update their Facebook status for free, but to use other features like viewing, commenting, posting on friends walls, confirming friend requests, 'Like' news feeds, view notifications and finding and adding friends, they will have to pay a minimal charge of Re 1 per day. According to Sumesh Menon, Co-Founder and CEO, U2opia Mobile, all the above mentioned features will be available to the user, but they will not be able to use Facebook chat to communicate with friends in real time. The users can interact with each other via the Facebook profiles but direct interaction is not available, although they can write on the walls of others to communicate with them. Facebook's Head of Mobile Business, Henri Moissinac said, "At Facebook, we are always exploring ways to enable people to easily connect and share with friends on Facebook wherever they are, whenever they want. The USSD-based Facebook access service is an affordable way for people to stay connected with their friends and family." The users will have to dial *325# ("*fbk#" for non-qwerty mobile handsets) from their handsets which will open a menu that will prompt the user to enter their Facebook username and password and after the one-time registration, a text menu is displayed for browsing through content. "Although smartphones are available in India, the number of users are not very high. Fonetwish will allow everyone with a mobile phone to access Facebook on their mobiles," said Sumesh Menon speaking to Techcircle.in. "Currently the USSD based service is only available on Airtel but talks are ongoing with other telecom operators for similar services. We are also looking at expanding our services to other countries like Indonesia and Philippines."